When in 1999 Merve Safa Kavakçı was elected as a Virtue Party deputy (MP) for Istanbul, she faced protests from colleagues in Parliament simply because she wore the hijab (headscarf). She was prevented from making her parliamentary oath because of her hijab, which is banned for civil servants in secular Turkey. She was eventually stripped of her Turkish citizenship, on the grounds that she had not disclosed her US citizenship (which she obtained on March 5, 1999). In 2007 the European Court of Human Rights found that her expulsion from parliament was a violation of human rights. The 42 year-old’s supporters received another boost earlier this month after a opinion poll revealed that the overwhelming majority of Turks are in favour of allowing women to enter Parliament with their hijabs. 78.1 percent of the 2,000 Turks who took part in the Strategic and Social Research Center poll said women should be allowed to wear the hijab in Parliament if they wanted to. Another 19.5 percent said hijab wearing women should not become deputies. The hijab debate was reignited earlier in March when a group of women, including journalists, representatives from NGOs and activists, launched an initiative. 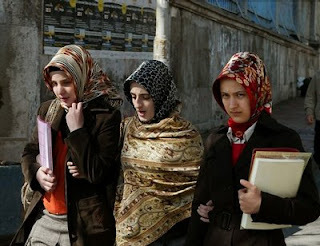 There is a strict ban on the wearing of the hijab in Turkey. Women wearing the hijab are not allowed to enter military facilities, including hospitals and recreational areas. There is currently no hijab wearing deputy in Parliament. The international NGO Assembly for the Protection of Hijab (Protect-hijab) welcomed the study findings.